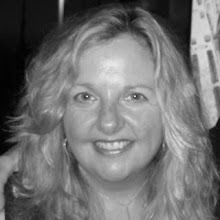 For Lynn Fredericks, co-author of Get Your Family Eating Right! A 30-day Plan for Teaching Kids Healthy Eating Habits for Life with Mercedes Sanchez, cooking time is family time. And so is eating time. Eating is cultural too. Children learn about their food heritages sitting around the dinner table and cooking and eating the foods and recipes of their parents and grandparents. This new book is rich with years of experience from both authors, who teach teens in NYC's public schools about cooking, and delicious, wholesome and easy recipes via the Teen Battle Chef program with Dr. Mehmet Oz's HealthCorps. Get Your Family Eating Right! is guaranteed to get stay-at-home and working moms and dads not only talking about how they can reduce pre-packaged and prepared foods at home but cooking and eating with the family. For me, food -- growing, cooking and eating it -- is an integral part of my family life so I appreciate Lynn's and Mercede's holistic and good sense approach. As a child, I don't remember a time when I didn't help get a meal on the table. I loved going to the grocery store, the farmers market and the butcher shop (back when the butcher gave children a slice of bologna, and the milkman left cold fresh milk at the back door) and cooking with my mother, who usually made dinner, or father, who always made breakfast. Dad had a green thumb and grew lots of fruit and vegetables in a huge garden in our suburban backyard that fed us, his office, and our neighbors. As a stepmom to 16-year old twins, made from scratch food, gardening, and cooking and eating together is central to our family's life. Get Your Family Eating Right! is a step-by-step manual, including tools, tips, and recipes with instructions specifically for the adult and those for the child highlighted. If you follow the 30-day plan, including their shared secrets on what to do when you get resistance from the kids, you'll give your family the gift of a lifetime on the joys of healthy food. They'll not only adopt healthy habits, understand nutrition, and experiment with new foods and recipes from around the world but they'll eat well too (and, for life). Lynn is divorced and found herself a single mom when her boys were quite young -- the importance of cooking the family's meals together sounds like it was healing for mom and her boys on many levels. So were the trips to the farmers market. Buying just picked, fresh fruits and veggies direct from a farmer -- either at the farmers market or a community supported agriculture subscription -- has many advantages, including making eating, shopping and cooking exciting as produce becomes available throughout the seasons and the family's menus evolve all year long. The book is as much about technique as it is recipes. There are beautiful photographs to illustrate knife and other skills, quotes from Julia Child and charts that show seasonal availability of produce to encourage experimenting with ingredients and flavors. I cooked, ate and photographed these four recipes from Get Your Family Eating Right! Even though my kids weren't around to help (those teenagers) -- the food was still delicious (and healthy too)! 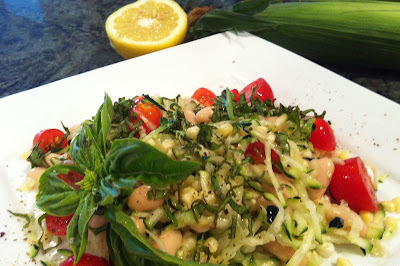 Three Sisters Salad - a classic native American salad made with the "three sisters" -- squash (grated zucchini), fresh corn kernels and beans (cannellini) -- cherry tomatoes and a basil, lemon and olive oil dressing. 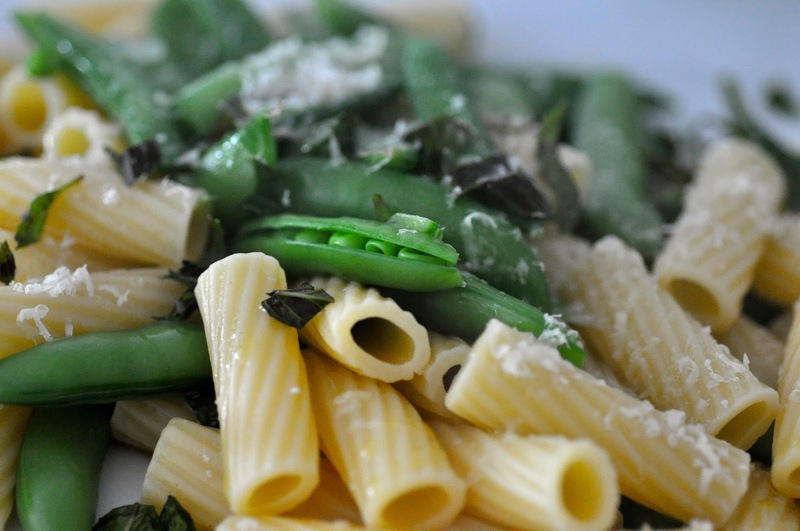 Snap Pea and Mint Pasta -- super easy farmers market fresh taste pasta dish made with snap peas, mint, a little olive oil and a sprinkle of Parmesan cheese. 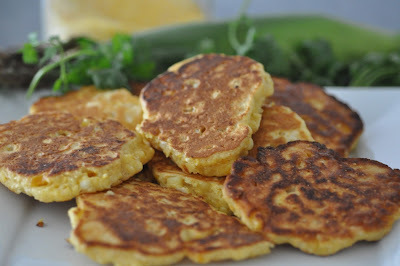 Venezuelan Arapas (Corn Pancakes) - a delicious and savory South American pancake made with cornmeal and chock full of fresh corn, and peppers. Serve with sour cream and fresh cilantro (great with maple syrup too)! This recipe is worth buying the book for. 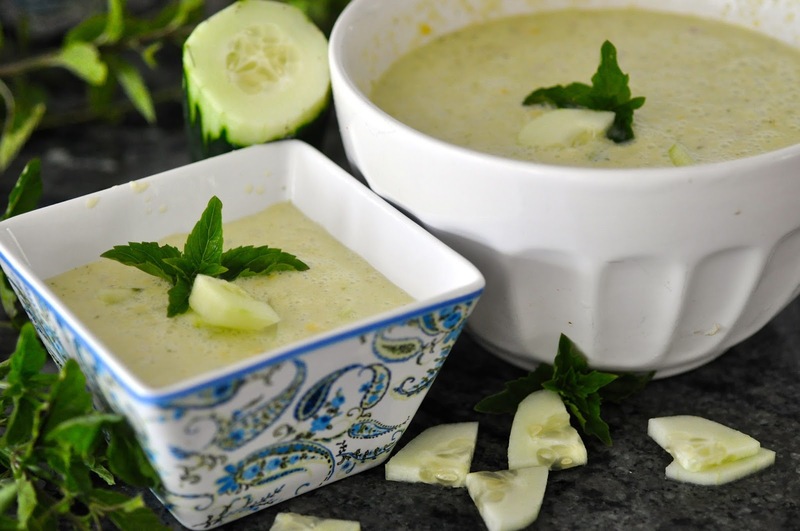 10-minute Yogurt Cucumber Soup - a blender soup made with uncooked cucumber, red onion, green pepper (I only had a yellow pepper), garlic and herbs (mint, and basil), great in the summer, especially when all the ingredients come from a local farm. To make some of the recipes in the book, take your kids to the farmers market or sign up for community support agriculture subscription. Here's where you can find locally grown food in New York. Farmigo - the new Community Supported Agriculture online shopping engine connecting employees and apartment residents in New York with local farm food delivered to their office or building.